Staffing is one of the biggest headaches in the restaurant industry. So much so, that 59% of operators named staffing as their top challenge to success. 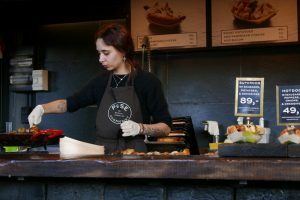 Much of this can be attributed to the high turnover rate experienced by the restaurant industry. According to Toasttab.com, the average tenure of a restaurant employee is one month and 26 days. That is a lot of turnover that is costing your business about $3500 every time someone walks out the door. You might think “Well that is just how the industry goes”. Believe it or not, there are some strategies you can implement right now to increase the tenure of your employees, boost morale, and increase profits. If you have done your work and hired a good staff that you want to keep, the first thing you need to do is start tracking how long your employees have been with your business. Understanding how long an employee stays with you, in all positions, can help you understand what you need to do to keep people. For example, if your average server stays for 11 months, design any incentives you may have around that. Use this information to extend the tenure of your employees. You can implement additional training, recognition, or pay raises at 6, 12, and 18-month intervals to see if it can help to extend the average. Ultimately, tenure reveals more than turnover does. But you can’t manage it if you don’t measure it. Hiring interviews, and occasionally exit interviews, are a common practice, but implementing “Stay” interviews can have huge benefits. Take the time to sit down with a veteran staff member to better understand why they are happy with their job, and why they have chosen to remain an employee. Also, give them the opportunity to talk about what you can do to sweeten the deal and keep them longer. This can help you put the finger on the pulse of what you are doing right, and some areas that could use improvement. An employee’s first day is just like a first impression; you want it to be a good one. Do your best to demonstrate energy and enthusiasm. Be visibly passionate about the company culture, values, and mission. The easiest way to do that is by creating a great company atmosphere. An employee won’t want to stay long if all the other employees are complaining about their jobs and how much they want to leave. Every shift should be a reminder of why your employee wants to stay with the business. Now, we all have bad days, but do your best to bring focus and energy to every shift. As a leader, you set the tone for the rest of the team. This can be accomplished by really focusing on the company atmosphere. Make sure your restaurant is a place that you and your employees are excited to return to shift after shift. By assigning a mentor to a new employee, you create a culture that fosters connection and allows a veteran to share insights they have acquired through experience. New employees can also become easily frustrated when not given the proper training to do their job correctly. Implementing a mentor program can help cut down on this frustration. Try to provide a mentor for every position; a dishwasher can benefit from a mentor just as much as a line cook. Stress is inevitable. You won’t be able to fix every situation, but there are some you will be able to. Do your best to identify stressors and eliminate them if possible. Dissatisfied employees often report feeling that no one is in their corner and they receive minimal support. Talk to your staff regularly about their pain points and ask them how you can help. As an added bonus, this can often lead to improved processes. Employees become frustrated when they feel as if they are stuck in their job with no room for improvement. Chances are that isn’t the case, they just don’t know what they can do to advance their position. Providing a clear outline of what employees can do to progress is beneficial to them and you. It helps with retention when employees have a clear outline of how they can progress. It seems too simple, that saying “thank you” would turn things around with an employee. Thanking staff is easy to do but often forgotten. It is an uncomplicated way to let your staff know that you appreciate their work. This will also help to open-up lines of communication between you and your team. Listening to them can give you an insight into problems you had no idea were occurring. The high turnover rate of the restaurant industry is not only a huge stress to operators and costs a significant amount of money. By listening to your staff, measuring tenure, and improving the atmosphere you can increase employee retention and profits. Some things just go together. Foods like PB&J, wine and cheese, and burgers and fries are matches made in heaven. There’s possibly no better pairing than that of pizza and beer. 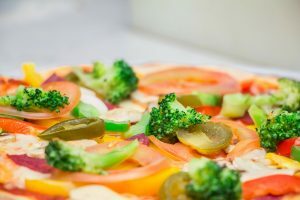 You might be tempted to say “all beers go well with pizza” and you wouldn’t be totally wrong, but some variations are better suited to different pizzas. They can help to enhance the flavors and take your dining experience to the next level. Craft beer is still taking the country by storm. New breweries are popping up every day with exciting and refreshing new beers. Now is a great opportunity to thoughtfully set up your pizza menu to promote sales of pizza and beer. I spoke to Cody Kelly, a brewer at Timber Creek Tap & Table on pairing beer and pizza. “Typically, meats go with darker beers and seafood with light. But malt really brings out the flavor in the bread of a pizza,” Kelly said. 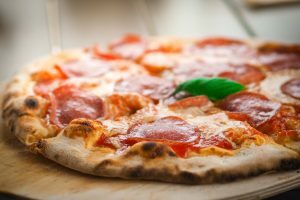 With this in mind, we delved deep into the world of pizza and beer to find some perfect pairings. A plain cheese pizza is a staple at large gatherings and in the homes of picky eaters. Pairing this with an ESB is a great combination. The bitterness helps to cut away the grease and leaves you with a nice cheesy flavor. The beers nuttiness is a natural fit with the slice’s saltiness. The caramel tones in the beer also pair well with a salty taste. A black IPA has spicy hops that bring out the pepper flavor in pepperoni, cut through on the greasiness, and prepare your tastebuds for the next bite. A nice dark roast is also able to draw out the smokiness in the pepperoni for an enhanced taste. A scotch ale with a caramel taste is the perfect companion to a meat lovers pizza; it can handle the impact of multiple meats in one bite while attracting the sweeter flavors of the sauce and dough. This helps to balance the spicier notes commonly found in pepperoni and sausage. If you can find one with a wisp of smoke it will complement the taste of the meats for a perfect dining experience. People tend to have very strong opinions about Hawaiian pizza. If you are pro-pineapple, consider pairing your pizza with a nice American blonde ale. The beer’s simple malt sweetness connects with the sweetness in the ham and pineapple but helps to tone down the fruit’s acidity. Rauchbier is known for having a smokey flavor, and where there’s barbeque there is smoke. The beers campfire wisps bring some grill flavor to the super sweet barbecue sauce. With a clean lager after-taste the rauchbier refreshes the palate. The IPA’s of today tend to be very green/veggie oriented, so what better to pair with a garden-inspired pizza. Find an IPA with hops that lean green such as oniony or grassy. The vegetal hops will give crispness to the onions and peppers on the pizza. With deep dish pizza, you need a great crust that can support all that food. By selecting a Zwickelbier, which is a less full-flavored variant of a kellerbier, the flavor will highlight the taste of the crust so that it doesn’t get lost in all the toppings. It may sound a little crazy, but the fruity notes will help to wash down the spice and goes well with the acidity of the buffalo sauce and blue cheese. It also has a solid malt backbone to pair with the bread. When speaking of white pizza, Kelly recommended lighter ales. As the name suggests, this beer is lighter in color and lower in alcohol. It is often consumed with meals and will complement the freshness of a white pizza. The malt will help to emphasize the toasted taste of the crust. Whether you are delving into a classic cheese pizza or experimenting with something a little more complex, there is a beer out there to compliment it. Darker beers are great with meat and veggies toppings, while white pizza’s and seafood pies go well with lighter beers. Selecting the right beer to pair with your pizza is a great way to turn a casual night’s dinner into a dining experience. Let us know your favorite beer and pizza combo in the comments below! What is the Difference Between Reclaimed and Distressed Wood Tables? If somebody had told you twenty years ago that, in 2018, restaurants would be lining up to serve their food on tables made from century old barnwood, you probably would have laughed and thought they were crazy. It’s true! Everything old is new again, and the trend toward modern rustic decors in the restaurant industry means that old reclaimed wood tables are more popular than ever. It’s kind of ironic when you think that restaurants, in their race to create the ultimate “Insta-worthy” moment for customers armed with tiny computers that weren’t even possible in the 20th century, are turning to the past for their inspiration. You may or may not know this, but reclaimed wood isn’t the only way to get a weathered, rustic looking table. In fact, given the relative scarcity of reclaimed wood, and subsequent higher price, many restaurants are turning to distressed new wood to meet their needs. In this article, we’re going to talk about both types of wood tables, including what they are, the benefits of each, and when to choose one over the other. Reclaimed wood is old wood that has outlived its intended use – a barn, boat, flooring, wine barrel, etc – and is repurposed for some other use. Technically reclaimed wood doesn’t have to be old, but older wood is more highly sought after. Wood from “old growth” trees, such as those that were abundant in the 19th and early 20th centuries has a number of advantages over modern lumber; it is denser than new wood and less prone to warping. Character – Character is a word that is often thrown around when talking about reclaimed wood: most often as a euphemism for old and time worn. The rich colors and patinas that are the hallmark of reclaimed wood can only be had through constant weathering and aging. Even more, the old nail holes, knots, and natural imperfections of the wood itself add to the unique character of reclaimed wood. History – Every restaurant has tables, but not every restaurant can say that their tables came from a salvaged barn erected in a field in Ohio in the late 1800’s. Reclaimed wood is not only prized for its utility, but also for its story. Even if you don’t know the exact origin of the wood in your table, the fact that it served a completely different purpose for the first half of its life is a worthy story in and of itself. Uniqueness – No two reclaimed tables are exactly alike because no two reclaimed boards are exactly alike. Think about that for a moment…in today’s day and age of mass production, it’s still possible to own something that is uniquely yours. Each reclaimed piece in your restaurant will share the same benefits and characteristics, but no two will look the same. Even if your table is one hundred percent red oak from the same barn, each board will have weathered slightly different, and will have its own unique coloration, textures, and natural imperfections. Resilience – What happens to wood in a barn? It gets banged up, scratched, and dented. Now quick, what happens to wood tables in a restaurant? They get banged up, scratched, and dented. The beauty of reclaimed wood lies in its imperfections. Unlike a brand new, perfectly stained wood table, reclaimed wood looks ok if it gets a little beat up. Now that’s not to say that we would encourage damaging your table on purpose, but it is nice to know that one little scratch or dent won’t completely mar the look, it will just add more character. Environmentally Friendly – One of the biggest benefits of using reclaimed wood is that it reduces the number of new trees that are cut down to be used as building materials. It also reduces the harmful emissions that are created by logging equipment and the trucks used to transport the lumber to factories for processing. In addition, it keeps a perfectly reusable resource out of the landfill and gives the old wood a new life. Distressed wood is new wood that has been artificially distressed and/or weathered to make it appear old. Distressing techniques often include putting nail holes in the boards, creating circular saw marks to replicate vintage logging techniques, or adding a patina to the wood so that it looks like it has aged over decades of use. Consistency – If you need a consistent look throughout your restaurant, then distressed wood is the answer. While it isn’t mass produced, distressed wood boards tend to look similar in that the same distressing process is applied to all of them. They may have marks in different spots, but the overall color and pattern of wear is usually the same. Price – Reclaimed wood is more expensive than distressed wood because it is labor intensive, and due to supply and demand pressures. As the demand for reclaimed wood has blown up in the past 5 years, the price has risen; there are only so many old barns available to reclaim. If you are looking for a rustic look without paying for reclaimed wood, then look at distressed wood. Colors – Distressed wood can be stained to whatever color you want while keeping the characteristics of the wood, whereas reclaimed wood looks best in its natural color. Should I Choose Reclaimed or Distressed Wood for My Restaurant Tables? The answer to this is, as always, it depends. If you are looking for an authentic rustic look with a story behind it, then reclaimed wood is definitely the way to go. If, on the other hand, you’re budget conscious and just want consistently great tables that look vintage, then you can’t go wrong with a distressed wood table. Either way, your customers will start taking out their phones to snap away as soon as they enter the place. If you need help figuring out what type of table would work best for your restaurant, give our customer care team a call at (800) 986-5352 and we’ll be happy to assist you. Posted on Aug 10, 2018 in Design and Furniture Selection, Restaurant Trends • Comments Off on What is the Difference Between Reclaimed and Distressed Wood Tables? Design is cyclical, and this draftsman-esque bar stool has made its way back around. You’ve probably even seen a similar backless style pushed up against a kitchen island in the current issue of your favorite home magazine. While Toledo stools all over are bringing vintage metal work back into kitchens and dining rooms, it’s also finding its place in restaurant design. Using a 16-gauge steel frame and industrial-era finish, the Toledo Backless Bar Stool can bring the same mid-century look to your restaurant with commercial-grade strength. This bar stool has a stylized metal seat, a 360° swivel, and an ornate foot metal foot ring that completes the vintage feel. The Toledo Bar Stool sits fixed at commercial bar height; it has a height adjustment lever that is purely intended to complete the vintage look and is not functional. 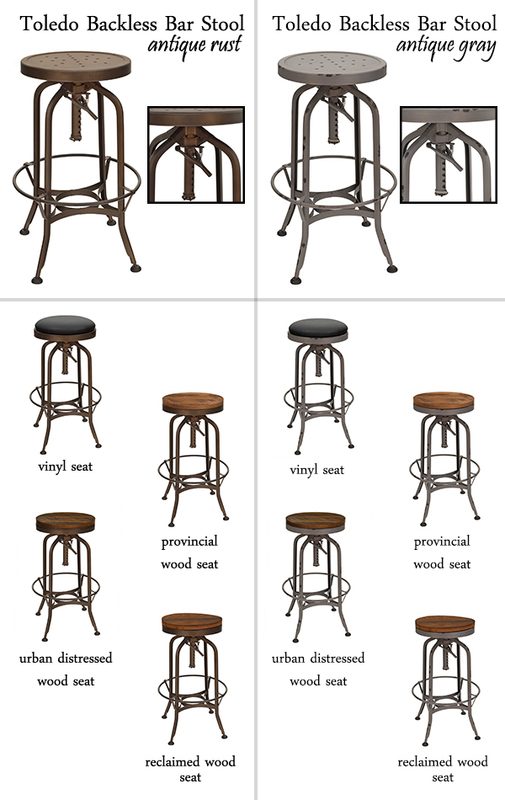 Backless bar stool designs are great for smaller bar areas because they take up less space by being backless. The ornate foot ring at the bottom of the Toledo gives it a larger footprint, letting your customers still have wiggle room. The Toledo Backless Bar Stool has a niche look that you get to customize! First, choose between an antique gray and rustic brown finish, then, choose your seat. You can either leave the seat as the standard metal or upgrade to a vinyl, urban distressed wood, or reclaimed wood seat. With so many options to choose from, you can be sure that the Toledo bar stool will match your bar space or table tops. See the Toledo Backless Bar Stool and other restaurant furniture with the industrial look here.